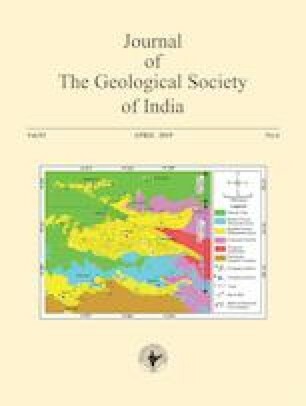 Detailed analysis of cleavage-fold relationships in the Mesoproterozoic cover sediments of Kaladgi basin, south western India, revealed three types of timing relationships between cleavage and folds: (1) cleavage developed earlier than folds. (2) Cleavage developed later at some stage of folding and (3) non-development of cleavages in folds. In the first case cleavage developed earlier than the folding. Evidences that support such an interpretation include high cleavage-bedding angle throughout the fold, asymmetric fanning of cleavage in the folds with large fan angles and rotation of cleavage more in the steep and short limbs of asymmetric fold. In the second case, cleavage initiated later at some stage during folding which is evident from low cleavage fan angles, relatively low cleavage-bedding angles in the limbs of folds and the offset of bedding trace against cleavage trace due to pressure solution. Even though pressure solution is ubiquitous throughout the fold the effects of offset are more pronounced in the limbs compared to that in the hinge due to changing angular relationship of bedding and cleavage throughout the fold. In the third case, cleavage is absent in the folds resulting in its sporadic occurrences and reflects its diachronous nature. The final geometry of cleavage in relation to folds at any location is a combined effect of relative timing of cleavage development and mechanism of folding involving layer parallel shortening, flexural slip, tangential longitudinal strain, syn- to post-fold flattening and hinge migration.